A fearsome form of the Hindu deity Shiva, the wide-eyed and fanged Bhairava embodies rage. Flames emit from his mouth, eyes, eyebrows, and chin, and his red hair appears as an aureole of fire. He wears a diadem entwined with snakes and skulls and set with large rock crystals, pendant ear ornaments of coiled snakes. A small hole that pierces the inner mouth was used during the annual Indrayatra festival to funnel beer through a drinking tube to bless eager devotees. 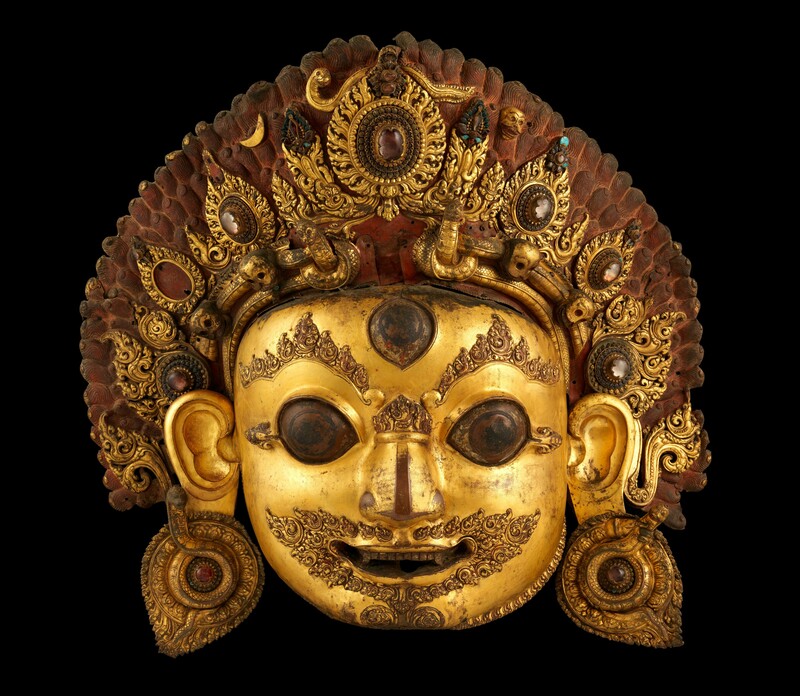 The representation of Bhairava as an independent, masklike head is unique to the Newari metalworkers of Nepal, who were famous throughout the Himalayan world for their skills in working copper. This masks similarity to an inscribed example dated 1560 suggests it was made in the mid-sixteenth century. New York. The Metropolitan Museum of Art. "Masterpieces of Tibetan and Nepalese Art: Recent Acquisitions," September 17, 2013–February 2, 2014.